I found this old photograph. 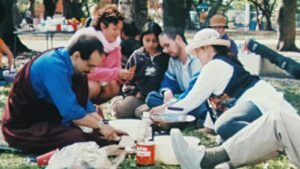 Our friend Kunga invited us to a potluck picnic at the park, but this time it wasn’t in Coconut Grove. I think it was at AD Doug Barnes On SW 72nd Avenue in Miami, back in 2005, I think. A nice group of people had gathered around, including Lily and her long term boyfriend at the time, David. It’s not a great photo, it appears a bit fuzzy and unfocused but to me, it’s…. It takes me back to that day…reminding me of the good times. Lily disappeared 5 years ago today… And yet it is still hard to believe Lily is gone. 5 years and still no answers, no arrests, only questions remain. Is it possible that she’s still alive somewhere? She was a tiny, young person, 4ft barely 100 pounds. Her exboyfriend says she left his place angry, taking bungee cords with her and leaving behind her cellphone and belongings. How would she have managed to survive, with no money, no ID, no phone? These are the questions that linger in my mind as the years go by. Today it is raining here in Miami. It seems appropriate. Lily loved the rain, just as I do. A few days ago, my girls and I released monarch butterflys in Lily’s memory. The little caterpillars came home with us on some milkweed plants we bought at Home Depot. Lily loved butterflys. Tomorrow Lily’s son graduates from Pre-K. She would have been so proud of her little boy. He is so much like her, looks just like her too. After his graduation ceremony, we are going to Coconut Grove to plant a tree for Lily. It will be our special spot to meditate and remember. “This is 911 what is your emergency?” “My daughter Lily is missing and she left her purse, wallet, and phone at home!” Lily Aramburo, a close friend of the family went missing on June 1, 2007. Everyone misses her dearly, including me. Just imagine having a friend that comes to your house almost every day and then suddenly disappears. Right before her disappearance she had a baby boy. His name is Palden. He has brown curly hair and big brown eyes. Right now he is 5 years old. He is so sweet and adorable, he is like a little brother to me. It is heartbreaking to think that now he has no mom and his dad is nowhere to be found! Because of this, he is being raised by his grandmother, Lily’s mother. Later, we celebrated her birthday, we went to her favorite spot in Miami Beach. The beach on 81st street and Collins Ave. A lot of her family and friends met us there. We wrote her name in the sand and formed a heart made of flowers. I still remember I used to go to that area of the beach and play with her there. We also released balloons with mantras (prayers) written on them. It was extraordinary to see them being released into the sky! The next year we held the first candlelight vigil at Peacock Park in Coconut Grove for the first anniversary of the day she disappeared. My sister and my friend Havana and I released butterflies in Lily’s memory. A lot of people came along with Power 96 and some people from the church donated water. My mom and I cut out butterflies, then we decorated them. Everyone signed it and we placed them on a poster board. Some people donated money. Money was donated because no one in the news had picked up the story so we were raising money for a billboard. Everyone was furious with that result. It is four years later and Lily is still missing. Lily Aramburo helped me with homework, played at the park, danced and rode bikes with me. She was an incredible friend and I will never forget her. She will always be in my heart and all the memories will stay with me. But I look forward to the day when someone can answer the question, were is Lily? Hopefully sometime soon. Friends, please remember to tune in to Investigation Discovery on Monday December 12, 2011 at 9pm (Eastern time), Lily’s case will be featured on the show “Disappeared“. Thank you for caring and for your continued support to Help Find Lily. Finally, some good news to announce! I am very happy to share that Lily’s story will be aired on Investigation Discovery “Disappeared” (my favorite show on ID!) 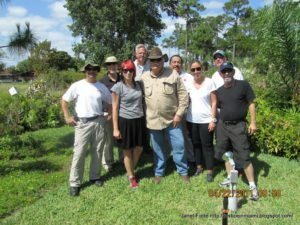 The NBC production/filming crew came down to Miami in May and interviewed Lily’s mother Lucely, Detective Hoadley, Christen Pacheco, Private Investigator Joe Carrillo and myself. We’re so grateful to Kate, Dave and Investigation Discovery channel! The new season premieres on October 24, Lily’s episode will air in December. Check out Lily’s little boy behind the scenes! Watch the sneak peaks below of Lily’s episode on “Disappeared”. Twenty-four-year-old Lily Aramburo left her fiancé’s Miami condo at 2 a.m., carrying only two bungee cords. Everyone knows that Lily would not have willingly left her 9-month old son behind, was there foul play involved in her disappearance? In what friends describe as uncharacteristic behavior, Lily Aramburo left her fiancé’s Miami condo at 2 a.m. without her 9-month old son and she never returned. We are still actively seeking justice for Lily and praying for resolution. You can help bring Lily home by spreading the word and sharing this video with friends, on Facebook and other social networks. Thank you for your continued prayers and support! The investigation into the disappearance of Lily Aramburo who was reported missing on June 2, 2007 has been active since Miami Dade Police Homicide took over the case. (Hallelujah!) 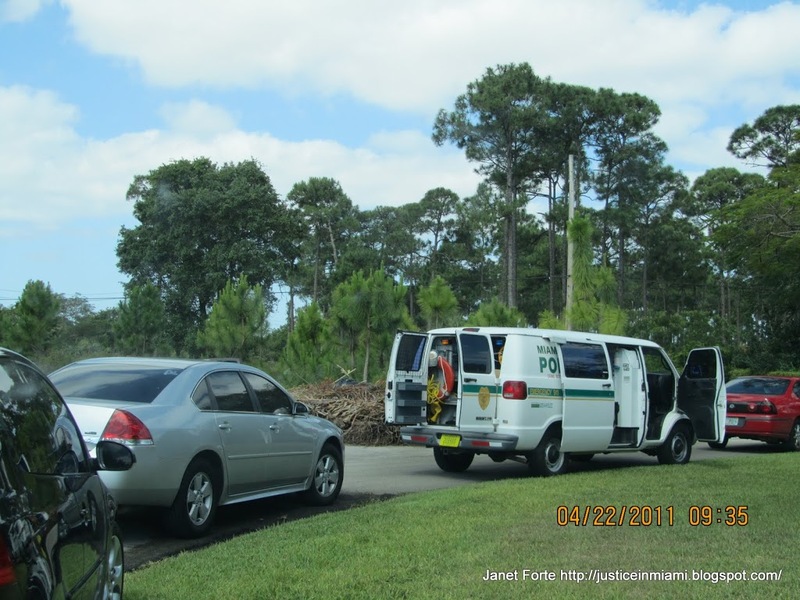 On Friday, April 22nd, 2011 Miami Dade Police searched an area close to where Lily disappeared, by the Dadeland Village Apartments. Unfortunately, at that time the police department didn’t approve of us bringing volunteers to assist in the search. The small group of Homicide detectives, crime scene personnel and search dogs tried their best but the area was too large and overgrown. Miami Dade Police gave us the green light to do our own search. We need at least 20-25 people to help us search the area. It is a lot of space to cover and it is totally overgrown so we’re going to need a lot of help. If you live in the South Florida area, please consider lending a hand. We’ll be conducting the search the week of May 9th. Please contact me for more information at janet.forte(@gmail.com). We’re also planning a candlelight vigil on that week. It’s going to be an opportunity to come together as a community to show our support for Lily and her family in this time of difficulty. It’s a time to stand together in prayer and solidarity in support of Lily. Our deepest respects and thanks to all persons and agencies involved in this organized effort to find Lily. We wish to extend our gratitude to Det. Ray Hoadley ~ thank you for your outstanding efforts, diligence and selfless dedication to Lily’s investigation and 30+ years of helping victims and making a difference in our community. We wish you a very happy and peaceful retirement. We’ll miss you! We’d also like to thank Sgt. Gallagher, Det. Miller, and the Miami Dade Police Homicide Specialized Investigations Squad members for their assistance and support in our fight to find Lily. And a special word of thanks to Joe Carrillo and partner Ana and team. We thank all of those who continue to help spread awareness for Lily online by sharing her pictures, blog posts and updates. Please continue sharing this blog and the Help Find Lily page on Facebook. We hope it helps encourage people to come forward with information. Please help bring Justice for Lily. Report anonymous tips to Crimestoppers 305-471-TIPS. I’ve only known Detective Ray Hoadley since December of 2010 when he took over the investigation into the disappearance of my friend Lily Aramburo, but I feel as if I’ve known him for a lifetime. The Miami Dade Police Department has lost a dedicated detective and public servant, for us – we are losing our hero. Where others failed, Dt. Hoadley succeeded. He did the impossible, he changed my view of the police department and police officers by selfessly doing his job. He read about Lily’s disappearance in an article written by Francisco Alvarado in the Miami New Times. He took it upon himself to do what needed to be done. He had the case transferred from the Missing Persons Dept to Homicide. He began the investigation from square one. It was hard work but he did it, easy peasy. Dt. Hoadley began his career in 1980, in the City of Opa Locka and retired in 2011 from the Miami Dade Police Department. Detective Hoadley is a good man, a highly skilled professional and our city will miss him dearly. Thank you, Sir. Tonight “Nancy Grace America’s Missing” spotlights the case of missing 3-year-old Allyson Corrales of Kansas City, MO. 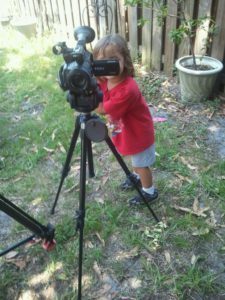 On tonight’s episode of Nancy Grace: America’s Missing – a show that aims at finding 50 people in 50 days – on HLN, Nancy Grace will be conducting an in-depth expose of 3-year-old Allyson Corrales from Kansas City, MO. Allyson disappeared in March 2009 after her mother was believed to have been murdered by her father, Luis Corrales. He is wanted for Allyson’s disappearance and is also the prime suspect in mom’s murder. Allyson did not just vanish. Someone knows something. Please take a good look at her picture and her father’s picture. They’re out there somewhere. Help bring her home. Nancy Grace: America’s Missing airs weeknights at 9pm ET on HLN. Don’t forget to tune in! I love Nancy Grace. She truly cares and it shows. Every night she shines the national spotlight on (often neglected) missing children and missing adults. Her show on HLN has been very effective and helped many cases. 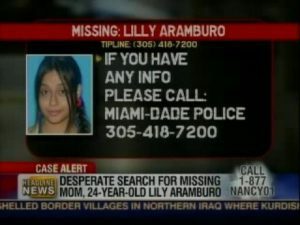 Nancy Grace was the first to give Lily Aramburo’s disappearance national exposure. I would love for Nancy to consider highlighting Lily Aramburo’s case on America’s Missing. 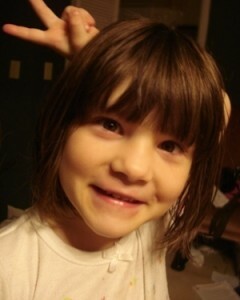 Lily was reported missing June 2007 by her live-in boyfriend. Her case was recently transferred from Missing Persons to Miami Dade Police Homicide Unit. We’re quickly approaching the 4 year anniversary of Lily’s disappearance. Lily Aramburo Featured in Highway Billboard and Miami New Times! It has been a very productive and extraordinary week for the search to Help Find Lily! 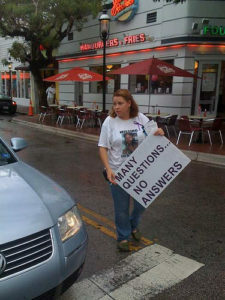 On Monday January 10, 2011, CBS4 Miami highlighted Lily Aramburo’s cold case. It felt phenomenal to finally see Lily on the news!! We’re ecstatic and very grateful to CBS4. On Tuesday January 11, 2011, a follow up article was written by Frank Alvarado from the Miami New Times. Thank you Frank! The article is posted below. Read it for yourself and please take a minute to comment if you feel inclined! Your thoughts are important to us. If you’d like to assist in the search for Lily, you can do so easily by sharing these articles and recent news with friends and social networks. You can also join and invite others to the Help Find Lily Facebook Page. THANK YOU so very much for caring about Lily!!! More than three years after she went missing, Miami-Dade Police investigators believe Lilly Aramburo was a victim of foul play. At least, that’s what an updated missing persons flyer seems to indicate. New Times wrote a cover story about the young single mother’s June 1, 2007 disappearance from the east Kendall apartment she shared with her then-boyfriend Christian Pacheco. In December, Aramburo’s case was transferred from missing persons to homicide. And the department has assigned the case to Ray Hoadley, a veteran homicide detective who solved the cold case murder of an 18-year-old Homestead girl killed in 1993. The development has given hope to Aramburo’s closest relatives and friends. An ongoing social media campaign started by Aramburo’s friend and Miami-based Internet marketing consultant Janet Forte generated national media coverage about the case, but has turned up few leads into what happened to the 24-year-old woman. Forte and Aramburo’s mother, Lucely Zalvidar, had grown frustrated with the police investigation, at times suggesting detectives were indifferent to finding Lilly because of her history of running away from home and drug addiction. A Miami-Dade police spokesman declined comment because of the open investigation. Hoadley, a 38 year veteran, was the lead investigator in the cold case of Trinity Robinson. In 2006 Hoadley arrested her boyfriend Christopher Phillips for her murder despite not finding the body. This past September, a jury convicted Phillips based on circumstantial evidence and witness testimony Hoadley gathered. The 38-year-old, who was sentenced to life in prison, is only the second person in Miami-Dade history to be convicted of murder without a victim’s body. Lily’s case has been cold for a long time. It’s been a long, agonizing 3 and a half years since the night of June 1, 2007. But finally we have a news update to share. If you’ve been reading this blog for awhile, you may have noticed that I have had my issues with law enforcement, mainly with Detective Mancha’s handling of Lily’s case. Out of desperation, we tried (almost) everything including a week long hunger strike in order to attain police attention and coverage from local media. Nothing worked. In the process, I’ve made my share of mistakes. The good news is, to our relief, the investigation into Lily’s disappearance has been reopened and reassigned to a new detective. Detective Ray Hoadley from Miami Dade Police Criminal Investigations Division Homicide Bureau is now lead detective. 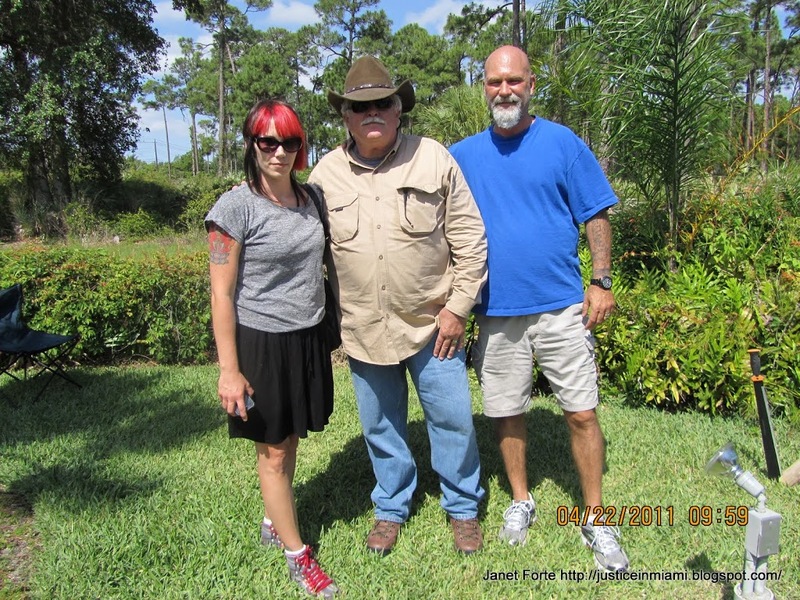 Lily’s family, Private Investigator Joe Carrillo and I have all met with the him. We are working closely together. I’m hopeful as never before. And I have absolute faith in Detective Hoadley. He’s got over 20 years of experience under his belt and has investigated many difficult cases. He’s very effective at what he does. Det. Hoadley is working daily to find the answers which will bring about a resolution to this case. Once again we’re reaching out and asking anyone with information to come forward. If you believe someone you know might be involved, please call immediately and share that information. It may be nothing or it may be the missing piece of information that will help bring closure to Lily’s family and little boy. The truth shall set you free. We know someone knows what happened to Lily and they need to step forward now, not tomorrow or next week or month or year from now – NOW! Make the call to Detective Hoadley at 305-471-2400 or you can email him at rbhoadleyjr@mdpd(.com). If you wish to remain anonymous please contact Miami Dade County Crimestoppers at 305-471-TIPS (8477) OR 1-866-471-8477. crimestoppersmiami.com You may be eligible to receive a reward. Assist in the search for Lily by sharing this post with all your friends across the internet. Follow @HelpFindLily on Twitter and connect with us on Facebook. And please be sure to stay tuned to America’s Most Wanted. Thank you so much for your help and continued support. Many heartfelt thanks for all your prayers for Lily and her family. We are especially grateful to those special individuals who have donated so much of their time and effort into the search for Lily; thank you Joe Carrillo and team. Thank you kindly for your dedication and hard work. And last but not least, sincere thanks to Miami Dade Police Detective Hoadley. Monday September 13th, 2010 Florida Department of Law Enforcement’s Missing Endangered Persons Information Clearinghouse hosted the twelfth annual Florida Missing Children’s Day in Tallahassee. During the weekend leading up to the event, advertisers with the Florida Outdoor Advertising Association (FOAA) will be donating digital billboard space throughout the state to feature children and adults from Florida that are still missing. Lamar, Clear Channel Outdoor and CBS outdoor are participating. The artwork will feature 25 missing children and adults. The billboards will run beginning today through Monday. Florida Missing Children’s Day is held each year to recognize past and present missing children and their families, to educate citizens on safety awareness, and to honor individuals in our state who have made a difference in the life of a child. Families of missing persons will travel to Tallahassee to attend the ceremony and honor the memory of their loved one. South Florida friends and family, if you’re in the area please take a look at the billboard featuring Lily. It is on the West side of I-95, 100 feet South of 8th Street. According to the FDLE, the billboard will be up until October 19th. If you see it and have your phone handy, snap a picture and send it to me via (HelpFindLily(@)gmail.com). 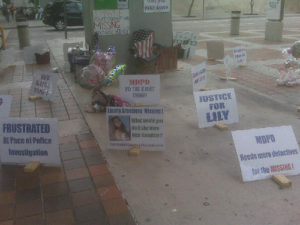 If you capture it on film or video, please share it on Facebook and Twitter – add #Justice4Lily. Please contact me if you need any assistance! Thank you for all your support. Thank you Florida Department of Law Enforcement! And a great big thank you to the advertisers for donating to this awareness campaign for Florida Missing Children’s Day. 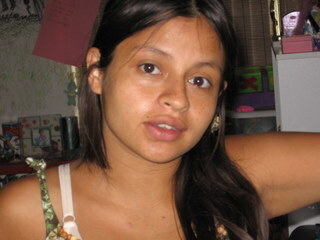 It has been 3 years since Lily Aramburo, a 23 year old South Florida mother, went missing. And the question remains, where is Lily? There is no doubt that someone holds the key to this puzzle. Lily was last seen at her boyfriend’s apartment on June 1st, 2007. The Dadeland Village Apartments in Kendall near Dadeland Mall. We know that Lily was having relationship problems. She’d been diagnosed with depression and schizophrenia. She was self medicating and suffering from substance abuse. Those last days before her disappearance, Lily and her boyfriend Christen Pacheco had been fighting a lot. He claims she just left. Walked out. The time was 2am. According to him, she left her cellphone and purse behind. He said she left in a nightgown and barefoot. He didn’t actually see her walking out -he had gone to the bedroom to speak with Kelly who was in bed. (But somehow) he claims she took bungee cords with her. And yet he said he thought she was just going for a walk to pick flowers. EJ, the last person in the apartment, was sitting in the livingroom. His statements contradict Christen’s. He said he never saw Lily wearing a nightgown or pajamas and he did not see her take bungee cords. Christen waited 24 hours to contact police and report his girlfriend missing to Miami Dade Police Department. He made the police report before calling her mom or calling friends or anyone to inquire about if they had seen her. Isn’t that odd? Wouln’t you make a few phone calls, ask around if anyone has seen or heard from her first, before calling police? He told police that story, that Lily had walked out of his apartment barefoot, in a nightgown with bungee cords. A police officer took the report. Despite there being a history of police being called to that address for domestic violence, the officer failed to see any red flags. The start of our long and painful nightmare began. If you have any information about Lily’s disappearance, we urge you to make an anonymous call to Miami Dade Crime Stoppers at 305-471-8477 or 1-866-471-8477. You can also submit TIPS via their website www.crimestoppersmiami.com. Monday November 16th, Lily Aramburo’s 26th birthday marked the start of a Justice for Lily Hunger Strike in downtown Miami, Florida. We hung up banners and put up a multitude of signs at Government Center passing out flyers and engaging the community all week long. Most of everyone we spoke to was supportive of our efforts. Many shared their personal stories and offered encouraging words and prayers, including a Buddhist monk who prayed with us. I made sure to update everyone as much as I could via Twitter. 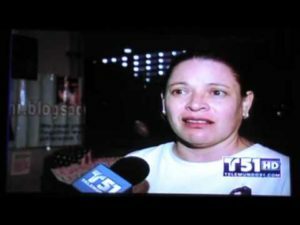 Telemundo was kind enough to cover our hunger strike, as well. (video posted below) We also had NBC6 and WSVN7 take footage Monday afternoon but the segments have not aired (that I’m aware of). Private Investigator Joe Carrillo went on the Enrique Santos Show on Friday morning, the last day of our 5 day fast. He gave a great interview on the radio which lasted about 15 minutes. Joe offers his insight into his investigation of Lily’s case. Miami Dade Police detectives called Joe and set up a meeting, which already took place on Tuesday November 24, 2009. I’m pleased that there is dialog between Joe and Miami Dade Police command staff. But the fight for justice continues. Monday, November 16, 2009 would have been my best friend, Lilly Aramburo’s 26 birthday. Lily has been missing since June 2, 2007. Her plight has been featured on Nancy Grace and Americas Most Wanted. Lily disappeared from the apartment of her heroin addicted boyfriend in the Dadeland area. Since then, her mother Lucely and I have launched an exhaustive search for her only to become disillusioned and extremely frustrated with the lack of effort of the Miami Dade Police Department. Police failed to locate two witnesses that were present the night she disappeared. We’ve been working with private investigator Joe Carrillo and his team for over a year locating the two witnesses within days. A convicted killer has been identified by the investigators as a person of interest in her disappearance. After four meetings with the missing persons detectives, a convicted killer who served time for murder has yet to be interviewed even though identified and located by the private investigator. Why? Police refuse to answer the why. 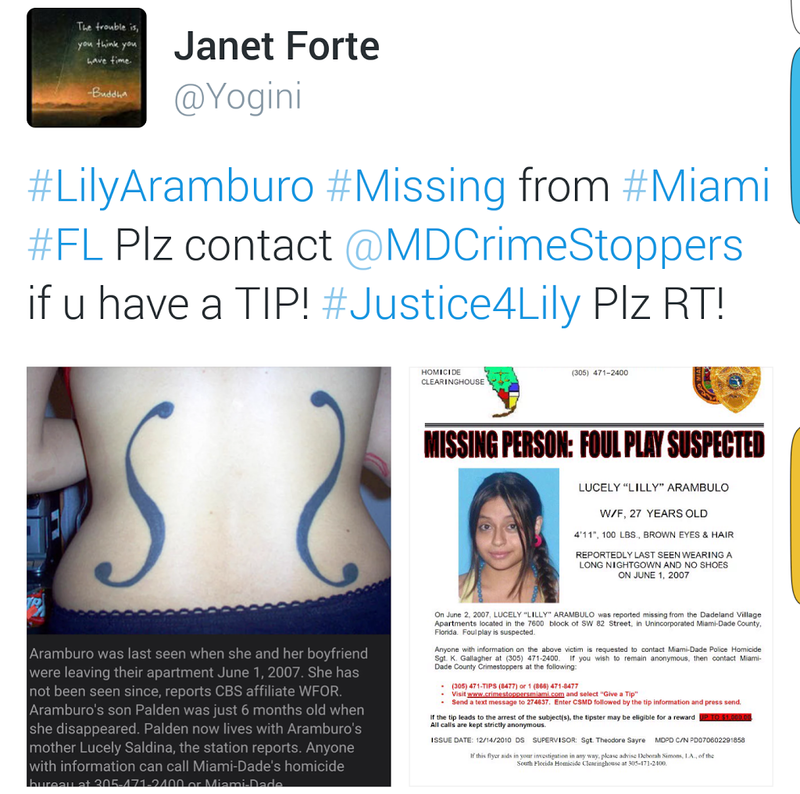 Lily’s mother and I desperately need to bring attention to her disappearance and want answers from the Miami Dade Police Department. We’re both commencing a hunger strike Monday at 9:00 AM in front of the Miami Dade Government Center until we get answers. We’d like to thank all of you for supporting us in our fight to find Lily and for keeping Lily in your hearts and minds. PLEASE do not stop passing on this blog to all you know! You can also help support the search for Lily by donating to Lily’s reward fund or by purchasing a T-Shirt. Anyone with information pertaining to the disappearance of Lily Aramburo is urged to contact Private Investigator Joe Carrillo at 305-926-3110 or call Miami Dade Police at 305-418-7200. 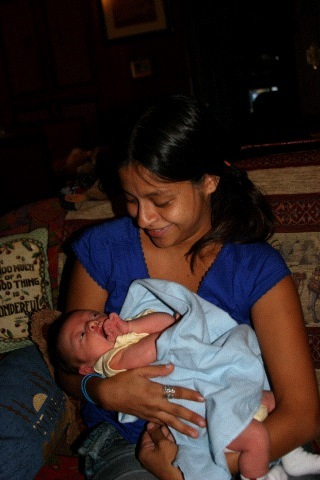 Monday, November 16, 2009 would have been my best friend, Lilly Aramburo‘s 26 birthday. Lily has been missing since June 2, 2007. Her plight has been featured on Nancy Grace and Americas Most Wanted . RSVP via FACEBOOK and please join the Find Lily Aramburo Facebook Cause! We’d like to thank all of you for supporting us in our fight to find Lily and for keeping Lily in your hearts and minds. PLEASE do not stop passing on this blog to all you know! You can also help support the search for Lily by donating to Lily’s reward fund via paypal or by purchasing a T-Shirt. Justice for Lilly Aramburo uses Google Friend Connect to power our site’s community, please connect with us Google Friend Connect. ORANGE PARK — Thursday began sadly with word that 7-year-old Somer Renee Thompson was indeed the girl whose body was found in a Folkston, Ga., landfill the day before. Search for clues continues at scene near where Somer Thompson disappeared | Jacksonville.com. A bank account has been set up for the family in the name of Somer Thompson. Anyone interested in assisting the family with expenses related to Somer’s death can do so at any area Vystar Credit Union. The account number is 0702794000. Second grader Somer Renee Thompson did not return from her Clay County school on Monday afternoon. She lives in the Grove Park neighborhood and was seen a few block from her home at about 2:45 p.m., according to the Clay County Sheriff’s Office. In a news release issued about the girl’s disappearance, the sheriff’s office said Somer’s mother was walking through her neighborhood looking for Somer when she flagged down a passing deputy and reported the 7-year-old child was missing. Somer had reportedly been walking home with her sister and friends but ran ahead of them heading toward home. Missing mother Lily Aramburo on America’s Most Wanted! In the early hours of June 2, 2007, Lilly Aramburo left her boyfriend’s apartment, never to be seen again. As her family and friends have told us, she would never leave her baby son behind on her own free will. Now, they have turned to America’s Most Wanted for help. Lilly is described as friendly and always willing to listen and help a friend in need. A blog has been started, called Justice in Miami, to raise awareness about her case. At 22, she was not without problems. She struggled with drugs, and may have found herself in a situation where people she knew did her harm. Lilly’s friends are desperate for answers in her disappearance. The quiet residential street in Miami where she lived turned different at night, and people are afraid to talk about what they see and what they know. Law enforcement sources say they know the last place she was seen alive, a private home on the street. Those who love her have great concerns about her not being alive when she left that house. A South Florida private investigator, Joe Carrillo, has received some great tips that have been passed on to Miami law enforcement. Those that know Lilly think some people might be afraid to come forward. Lilly’s loved ones want to know what may have been done to her. 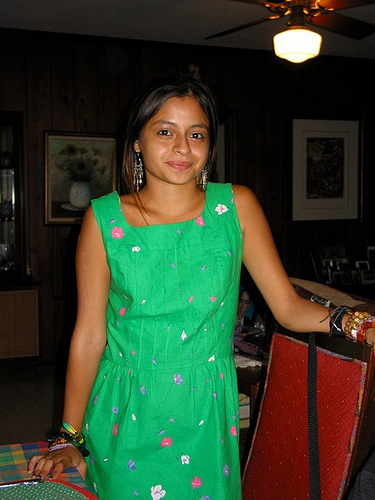 Lilly Aramburo has been missing since June 2007. A South Florida private investigator has received some great tips that have been passed on to Miami law enforcement.